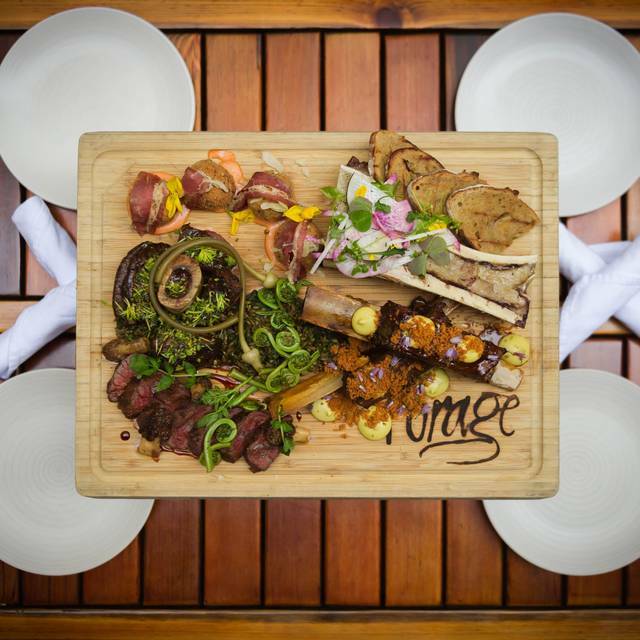 The Bar at Forage is the perfect place to experience the Saturday Bison Board. You sit front and centre in the middle of all the action. Your attentive bartenders will guide you through your delicious dinner. We’ve paired up the board of ever-changing cuts of bison with a beautiful bottle of BC wine. Your choice of: Blue Mountain Estate Winery Pinot Noir, La Frenz Winery Cabernet Sauvignon, or Niche Wine Co. Foch and the giant board for two for $160 plus taxes and gratuities. It couldn’t be any simpler to experience the best of BC. Book your spot for two quickly, as they go fast. There’s a total of 10 seats on Saturdays 6pm only. I had been looking forward to a visit to Forage for 2 years after finding them on Instagram. My boyfriend and I decided to make the trip into Vancouver to celebrate both our birthday's + 1 year anniversary as they all occur in the same week. Our server/bartender was great - knowledgeable, attentive, friendly and professional. Unfortunately however, despite our reservation for the Bison Board experience our food ended up taking well over an hour to come out. The server brought us out a Bison carpaccio after 45 minutes of waiting to apologize which was the best thing we ate all night. A couple sat next to us shortly before we got our board and they got one the same time as us. The board was VERY underwhelming, especially for $160. The pasta dish tasted like hamburger helper - really lacked any creativity and we felt the cheese served on top was a poor pairing as the dish lacked flavor. The rest of the board was OK, but still lacked the creativity I was longing for at Forage. The server noted our disappointment and offered a taste of some ice wine which again was nice but did not save the experience for us. Forage seemed like a unique experience from following them online but fell short once we got to visit.